There are many different types of lawn mowers. Choosing the right type can keep your grass healthy and make lawn care easier. Determine what types of lawn mowers are best for your yard before you compare features and costs. The type you select may depend on the size and layout of your lawn, your budget, and your commitment to the environment. 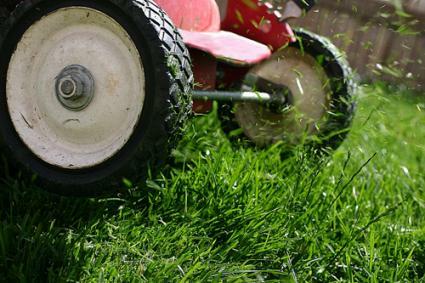 If you have a small lawn to mow, consider using a manual reel, or push mower. Because they run on muscle power, you can get quite a workout while mowing the lawn. Reel versions are coming back into fashion because they are quiet and don't pollute. They're also lightweight and easy to use. And they are better for your grass because they cut grass blades like a scissors-more cleanly than a rotary mower. Choosing one with a narrow width allows you to mow in tight places, where other mowers can't fit. One disadvantage is that they can't cut through tall grass or tough weeds. Hills can also be challenging with a manual reel mower. Rotary mowers are the most popular type of lawn mower. Rotary push versions work well for flat lawns that are not too large. They cut with a circular blade that rotates under a protective housing. Rotary push mowers typically are gas-powered and commonly have at least 3.5- to 4- horsepower engines. Larger engines give you more power to cut through denser grass and weeds. Other factors to compare are weight, cost, safety features, and ease of starting. If you are concerned about the environment, consider that gas-powered lawn mowers use a lot of gas and cause air pollution. And they can be very loud. If you have a large or hilly lawn or just need help mowing, a self-propelled rotary type may be a better choice than a rotary push version. They move by their own power and only need you to walk behind and guide them. Be sure to purchase one with an engine powerful enough to cut the grass and propel the mower up inclines. Look for an engine with at least 5- to 6- horsepower. Rotary lawn mowers can also be purchased as or adapted to mulching. Mulching cuts grass clippings into small pieces and leave them on the lawn instead of collecting them in a bag. A mulching mower saves you the trouble of bagging clippings and taking them to the compost pile. Grass clippings that are left on your lawn provide food for your grass. See Lawn Fertilizer. Electric lawn mowers are becoming more popular because they are easy to use and more environmentally friendly than gas-powered. Rechargeable types eliminate the need to drag around a cord. Electric versions are available in both reel and rotary types and as mulching mowers. They are quiet and work well for lawns up to 5,000 square feet. Choose a riding machine if you have a really big lawn and would rather ride than walk. Riding types are generally used on lawns that are one acre or more in size. Riding mowers come in many varieties and can allow you to tow cartloads of soil and other materials. However, they require large storage space and cost quite a bit more then the others.